1, 2, 3, 4 NKVE 10, 15, 20, 32, 45 MCE-P are variable pressure units for residential building service and commercial building service. They can also be used in agriculture and in watering systems. 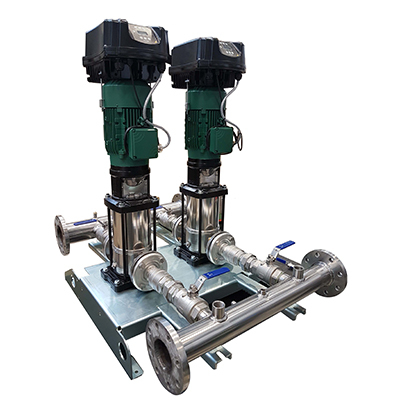 NKVE are 1, 2, 3 or 4 multi-impeller vertical centrifugal pumps with coupling with MCE-P variable frequency drive installed as standard. The models with NKVE 10 S, 15 S, 20 S have the parts in contact with the liquid in AISI 304 stainless steel. The models with NKVE 32 and 45 have the pump body and upper flange in cataphorized cast iron. The impellers, diffusers and pump casing are in AISI 304 stainless steel. One control unit and one pressure sensor per units. Delivery check valve and expansion vessel for each pump. X version with materials in contact with water in stainless steel AISI 316. The units are supplied assembled, set and tested directly at the factory. IE3 electric motors. D.Connect ready (D.Connect Box supplied separately).